I was up at the crack of dawn – I am always like this when I am excited, and this morning my thoughts were filled with Phoenix Islands as I started counting down the final 24 hours. The rest of the team is somewhere in the sky and I headed out to buy the last minute things we needed because once we leave there will be nothing but open ocean, and with the exception of Kanton, uninhabited islands. My mission this morning was to buy rat traps! There was a massive effort in 2009 to clear three of the PIPA atolls of rats that had been introduced and were impacting local bird populations. The Phoenix Islands, due to their isolation, have significant bird numbers, with five of the eight islands being important bird areas. The boat has been fumigated twice in Fiji and we are packing extra traps to place on the boat in case we get a few ‘naughty stowaways’ from Samoa. The Kiribati government has developed biosecurity protocols to help protect these islands, and we will be following them exactly to make sure we do not impact the marine or terrestrial life of these atolls. We also hope to find time to visit some of the islands and see if the previous eradication programs have remained effective. My fellow Pacific Islander, Jay Andrew from the Palau International Coral Reef Center, who is an expert on collecting coral cores to study climate change, arrived today from Palau. 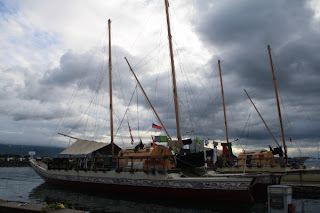 As we headed to the harbor to see the ocean voyaging ‘vakas’, I was reminded and humbled by the long voyages that Pacific Islanders did across the Pacific. 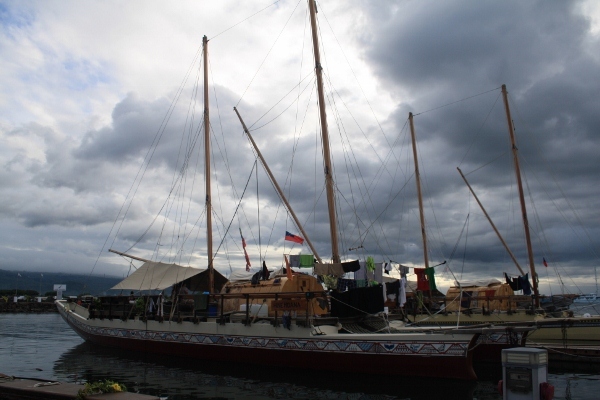 There were no compasses, no GPS, no radar, no radio - yet these Islanders used the seas and skies to guide them across wide expanses of open ocean. Of course, we are traveling with the Nai’a who is both outfitted with all the latest navigation tools and technology and we are bring out own inflatable hyperbaric chamber too in case someone gets decompression sickness! As we looked out to sea to watch the sun setting over the Pacific we saw the Nai’a patiently waiting for our team of scientists to arrive.